Most Hall Worthy: Marty, Cowher, Knox, Coryell? With the passing of Chuck Knox it got me thinking of four coaches that are border-line for the Hall of Fame. Each of these guys have positives and negatives. I’ll go through the four and give my analysis of the one I think is most worthy. Marty is the winningest coach of the four. He won 205 games which is sixth all-time. That stat alone puts him in contention for the Hall. He was Coach of the year in 2004. What hurts Marty is his only championship was as a linebacker for the Buffalo Bills in 1965. His playoff record was a dismal 5-13. A couple of the playoff losses were at home against inferior teams. In 1995 his Chiefs team lost at home 10-7 to an underdog Indianapolis Colts. While in San Diego his Chargers team had two disappointing home losses to the Jets in 2005 and the Patriots in 2007. Coryell has many supporters for the Hall. One major reason is he was an offensive innovator. 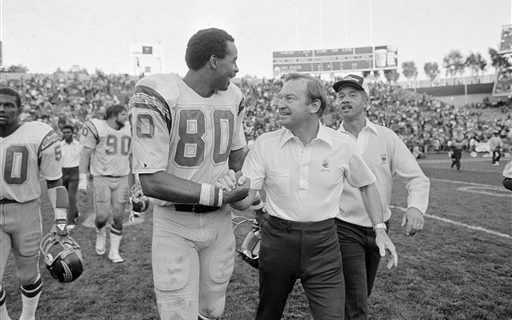 When you see tight ends who are more of an offensive threat, this was done first with Coryell with Kellen Winslow. The “Air Coryell” model one could argue is now common place today. He was years ahead of his time. He was the best coach ever at San Diego State before the NFL. His 127-24-3 college record is legendary. Mike Martz, Joe Gibbs, John Madden have all lobbied hard for Coryell. The problem with Coryell is bad home losses in playoff games. His 3-6 playoff record isn’t great. His 1979 team was 12-4 and lost at home to Houston. The Oilers were without starting QB Dan Pastorini, RB Earl Campbell and WR Ken Burroughs. The star of the game was Gifford Nielsen. Ouch! His 1980 team went 11-5 but lost at home to the Oakland Raiders in the AFC Championship game. Bill Cowher is the only person on this list to have won a Super Bowl. Cowher’s Steelers defeated the Seattle Seahawks in 2006 for the title. This might have been the worst officiated Super Bowl ever. Every call went the Steelers way. He made it to the Super Bowl one other time, losing to the Cowboys in 1995. Cowher’s teams lost five times at home in the playoffs. His teams were 2-4 in AFC Championship games. All of those losses were at home. The worst loss was to a Stan Humphries led San Diego team in 1994. He was two time coach of the year in 1994 and 2002. Knox turned around three football teams. The Rams, Bills and Seahwaks. He had a 193-158 record. The Bills were a mess before he came. The Bills had their scouting prospects in a shoebox. Knox put into place the scouting department that was with the team well after he left. Knox never made it to a Super Bowl. The reputation of Ground Chuck is a tough one because everyone ran the ball in the 70’s. Bob Griese threw 6 passes in the 1973 AFC title game. He was 0-4 in title games. Knox never had a great QB. Here are his QB’s: Pat Haden, James Harris, Ron Jaworski, Joe Namath, Joe Ferguson and Dave Kreig. His playoff record was 7-11. Here were the quarterbacks he lost to in the playoffs: Roger Staubach (2x), Fran Tarkenton (3x), Kenny Anderson (2x), Warren Moon and Dan Marino. In my eyes he is the only one on this list without a bad playoff loss. To learn more about Chuck Knox as coach of the Bills, read Budd Bailey’s story on Knox.